We are only a few short weeks away from the premiere of Avengers: Endgame. And as the release date approaches and we reach the end of this journey, we want to look back on everything that brought us here. The heroes we watched struggle, grow, and save humanity over the last ten years and our favorite moments of their stories. We will be going through each phase in order, covering every movie leading up to April 26. 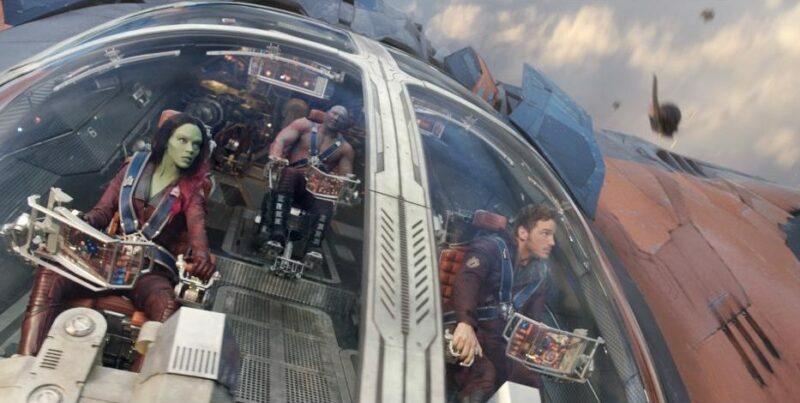 Zoe Saldana, Dave Bautista, and Chris Pratt in ‘Guardians of the Galaxy’. Courtesy of IMDb. We were first introduced to this new team of superheroes in 2014. What started out as a misfit group of criminals, turned into a family who would come to call themselves The Guardians of the Galaxy. What I love most about Guardians of the Galaxy is the soundtrack. Often times the soundtrack of a movie is just there to set the mood, unless it is a musical where the songs enhance or advance plot and character development. Guardians of the Galaxy makes the music such an integral part of the movie that I cannot imagine the movie would have been as successful without it. I really enjoy the misfit nature of the Guardians. The characters are a little strange and their motivations are questionable at best, but still they come together to do what is right to save the Galaxy, often by very unconventional means. When Peter Quill decides to distract Ronan by singing and dancing, so the others can get the orb, is a perfect example. This was something that we had not really seen in the Marvel Cinematic Universe up until that point. Loki had used misdirection numerous times, but it was different to see it coming from the hero of the story. Be sure check out the rest of this series!